Hello and welcome to the third group post for the September Papertrey Ink Release! The new products you are seeing here will be available in the store at Papertrey Ink on September 15th at 10:00 EST! Today's post is all about my favorite Christmas activity, decorating the tree! I love Christmas ornaments and make them all year long. I have ever since I was a kid! I had my own Christmas tree in my room when I was young because I had made so many ornaments they wouldn't fit on the tree in the living room! 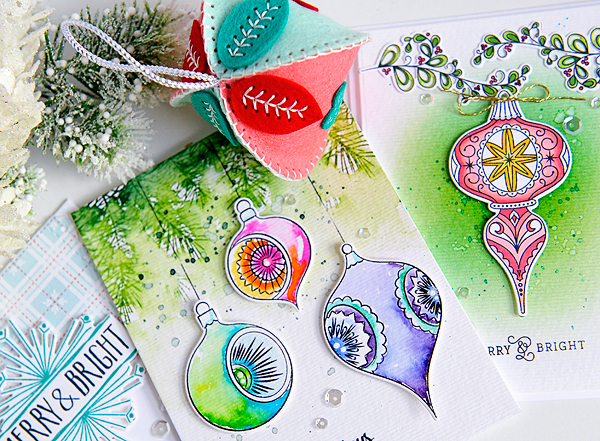 So today we are showcasing a beautiful new set called Vintage Ornaments II by Dawn, What The Doodle: Ornament by Betsy and the fabulous new Christmas stitching dies by Erin! So much fun-ness! My first card uses Dawn's Vintage Ornaments II. There are outline stamps as well as solid images, so if you don't like to color you can still stamp the parts in different colors. I chose to use just the outline images and watercolor them. First off I stamped the pine from Holiday Greens Borders along the top with Pinefeather and New Leaf. I then just wet my brush and went over it lightly to blend the colors and give it a watercolored look. I also splattered some Pinefeather over it when it was dry. I stamped the ornaments in permanent black ink and watercolored them with Peerless watercolors. I cut them out with the matching dies and added them with foam tape. I drew the strings in with a black pen. I added a few sequins and stamped the sentiment in True Black. My next card features Betsy's new addition to the What The Doodle series. And what a beautiful one this is! I just love that ornament and the swirly little greenery is pretty cute too! I blended some Distress ink onto watercolor paper for my background and splattered with clear water and then some of the same ink watered down. I colored the ornament and greenery with Copic markers, cut them out with the matching dies, and adhered them with foam tape. I stamped that pretty little sentiment at the bottom with True Black ink. I added a little bow with some gold string to the ornament and a few clear sequins. There is a smaller ornament along with the large one in the What The Doodle: Ornament set and I really wanted to use it too. I thought it went perfectly with Maile's new Splits: Merry & Bright! I used some paper from the Christmas Plaid paper pack, and the die from Noted: Scalloped Square, to create the scalloped piece at the top. The stars are from the Star Scribbles set, and I embossed them with gold embossing powder. And now I have this sweet little ornament I made with Erin's new Stitched Ornaments: Topped Die. I love these things! I saw something similar on Pinterest a while back and tried to replicate it myself and failed miserably, so I was so excited to see the dies for this! Now I can make them and not fail! haha! I used two strands of white DMC floss for all of the stitching. I did a blanket stitch around the edges of the ornament, but used just a back or straight stitch for the leaves and hearts. I first sewed the leaves and hearts onto all of the pieces, then I took a pink and a blue side and stitched those together twice. I then took those two pieces and sewed around the whole thing, stuffing it as I got near the end. This was really fun to make and I can't wait to use all the other new Christmas dies! Thanks so much for stopping by! I'll be back tomorrow with a few more Christmasy things to share! All of the new products will be available at Papertrey Ink on September 15th, at 10:00 EST! What a group of gorgeous cards and a super hand stitched ornament. I know how much you love all things Christmas and right about now you are absolutely in your element. 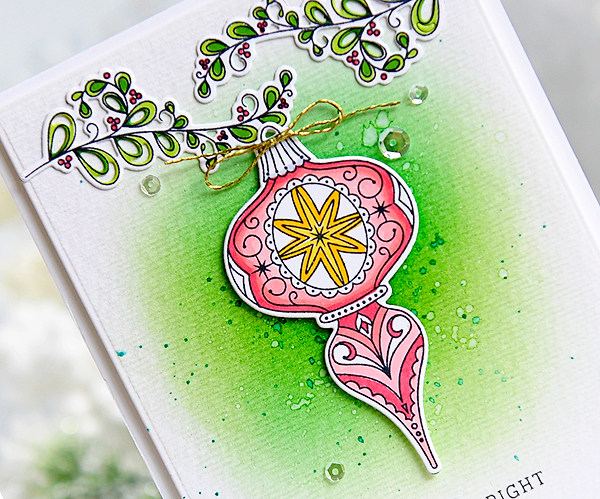 The stamp set Dawn created is beautiful and you really made those ornaments shine with your watercoloring! That stitched ornament is fantastic. Your stitching looks great. You picked some pretty colors, too. Absolutely fantastic work! Thank you so much for sharing. And inspiring. Hugs! 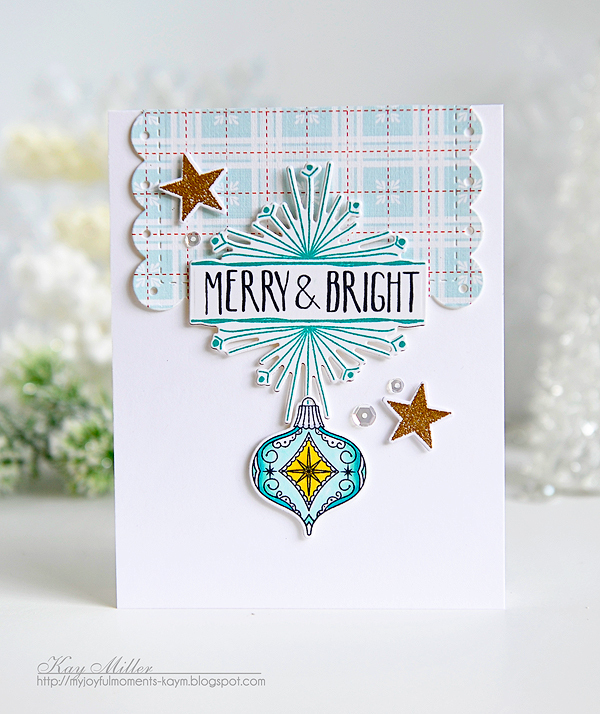 Adore the pretty coloring on your vintage ornaments card! Gorgeous color! All so lovely and beautiful, hardly know where to begin. The gorgeous ornaments this month were made for your artistic touch! And the sweetest felt ornament ever in colors yummy enough to eat! All vintage wonders! Hi Kay. Your watercolored ornaments are gorgeous. I love how you left a bit of white in the branches. 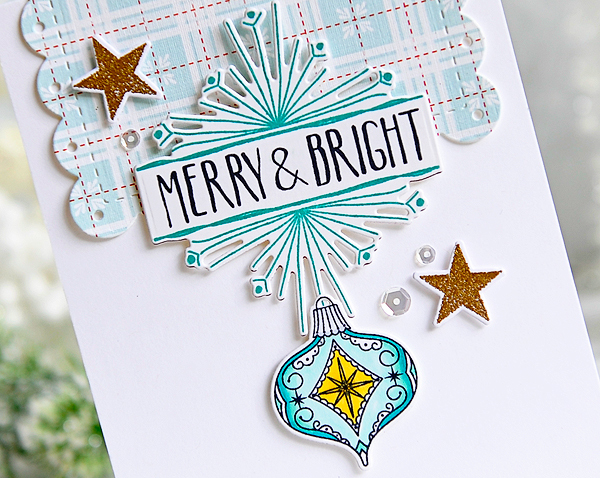 The What the Doodle series is one of my favorites (I love the detailed dies) and you paired your pretty ornament perfectly. It is Merry and Bright! Your stitched ornament is so pretty Kay. Thanks for your always beautiful inspiration. Your cards are beautiful!!! I love the stitched ornament too! Love your colors so much! Oh my, all classic it-could-only-be-Kay beauties. So good it hurts. Your colouring and colour choices are to die for. And then there's the photos. Sigh. Beautiful projects, Kay! Your cards just glow! And that is the sweetest little ornament! Wow, I'm madly in love with that 3 ornament card! The watercoloring is so gorgeous. Just gorgeous! They are just like my ornaments that I hang each year on the tree, love the old fashioned ones! 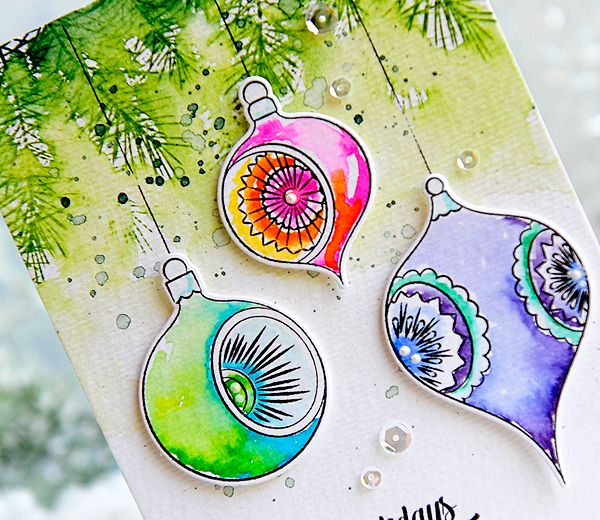 Your watercoloring really brings these ornaments to life, and I love how you designed your clean and layered card, too! 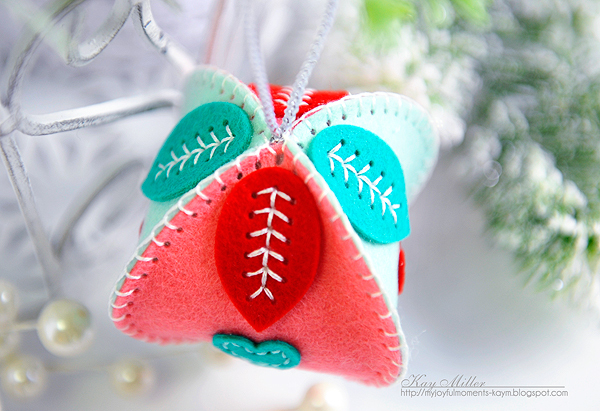 I also love your color combo on the stitched ornament...Very pretty! I think these new goodies were made for you, Kay...You've done such a beautiful job inspiring us, once again! Oh, wow!! Your Christmas cards with the vintage bulbs are spectacular, Kay! Such wonderful water coloring as always! Looking at your lovely cards brings fond memories of a few vintage Christmas bulbs I have from my Grandma! 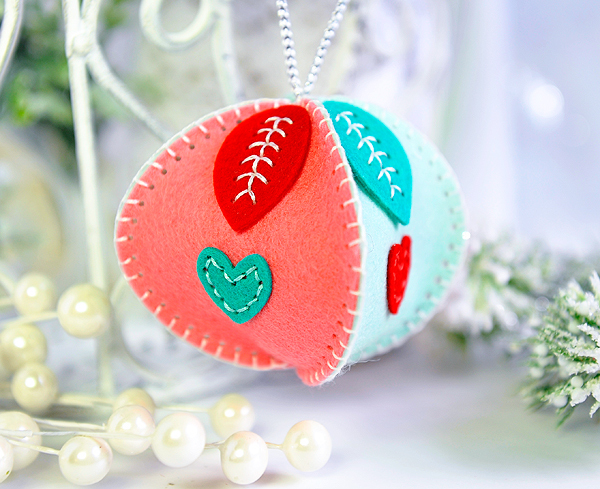 Your felt ornament is so pretty, too! Holy COQUITO! Puerto Rican Yummy Christmas drink! I am in a full blown heavenly anxiety ATTACK!!! And to top it off I can't find the oxygen tank! Seriously girl, I can say truthfully that every time I see one of your creations my heart does a somersault, and since you joined the PTI team it has increased so much....hence the oxygen tank! PLEASE,PLEASE,PRETTY PLEASE, give me (us) another watercoloring video! I am patient, it could be within this year! Anyhow I wanted to describe the deliciousness that I have seen today, but wanted to give you another word instead of SCRUMPTILICIOUS, so I invented the word.....wait....here it comes....are you ready....GORGEOURRIFIC! It is the fusion of Gorgeous and Terrific.....and... you are welcome my sweet friend! I have always admired the talent on the PTI design team through the years. But you, sweet Kay, are a true artist who rises above all others!! Your first ornament card is an absolute masterpiece, my goodness. The others are beautiful too. And that ornament is so sweet. The blanket stitch is terrific. You are perfect for PTI and they are blessed to have you on their team. Hello again. I wanted to stop by (again) and apologize for my comments being published twice. It happened yesterday too, which is why I deleted one. Hopefully this comment will post once. I'm not sure why, but my husband is helping. (Can you tell I'm a little embarrassed). Hope you have a nice night. Oh my gosh again!!!!!! Love it all and that stitched ornament is gorgeous , stitched perfectly!!!!!!!! You make everything shine and I want it all! I love what you did with the card that has the plaid on it. LOVE LOVE LOVE your ornaments, they are so gorgeous! You have given me so many more cards to CAS!! And thank YOU so much for coming and leaving me some love...it is the best feeling when I get kudos from a pro like you! Absolutely WONDERFUL Kay - LOVE them all!!! Love, love, lovin' your ornaments Kay! Your Vintage II card. WOW! Fabulous! Can that be my Christmas card?! lol Some ppl! 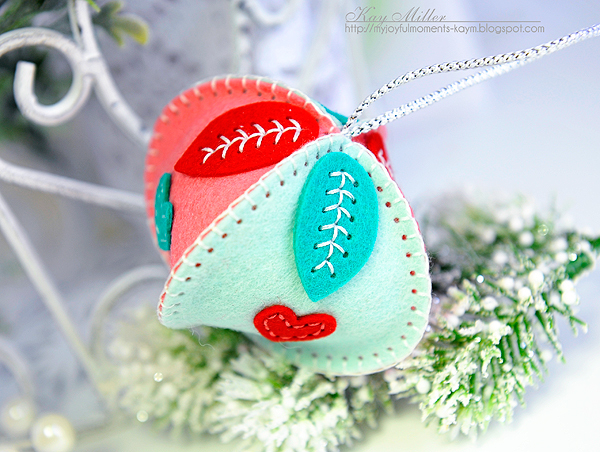 lol Gorgeous stitched felt ornament...love the detail you added and the colors...so beautiful! Thank you so much for sharing and inspiring! coloring anything and the ornaments are just perfect. 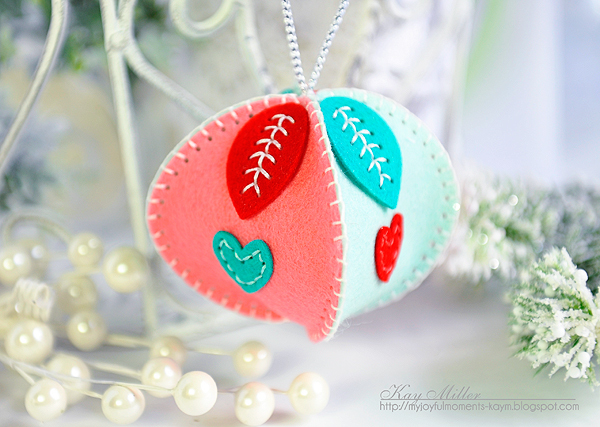 Love your little perfectly stitched ornament... lovely colors!